Trump Landslide Victory Predicted: Clinton Can Only Win By Stealing the Election — Democrat Voting Fraud Must Be Monitored! No matter how you slice and dice the electoral vote or the popular vote, Donald Trump is destined for an unprecedented landslide victory. The following voting bloc analysis is really just common sense. However, the mainstream media will do everything in its power to distract the electorate from the obvious. Why is that? 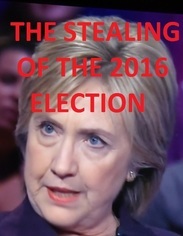 Because the only way that Hillary Clinton can win this election is by outright theft and LOTs of election fraud. That is the only way for her to win—illegally. First, not a single Republican or Conservative or Tea Partier or Right Winger or Christian will vote for Clinton. Yes, there will be a few who will go and accidentally “pull the wrong lever”, but this massive voting block, to the extent that they show up at the polls, will vote overwhelmingly for Trump. The middle ground occupied by the Independents will vote Trump. Yes, a few will momentarily lose consciousness and accidentally vote Clinton, but the vast majority will vote for Trump. The Berniacs, who were profoundly betrayed by the campaign fraud known as Bernie Sanders, are pissed. Extremely pissed! They will not vote for Clinton for numerous and obvious reasons. Many will not vote because of the naked betrayal they suffered at the hands of Sanders. However, the vast majority who do vote will unanimously vote for Donald Trump. He is a truly populist candidate just like the Bern pretended to be. The Berniacs represent a huge voting bloc that Clinton & Company majorly disrespected. As for the Democratic side, the true liberals, real progressives, ultra-leftwingers and dyed-in-the-wool Democrats will not vote for Clinton. They will, by and large, stay home on election day. Those who are genuine old-school Democrats and principled citizens will not bring themselves to vote for an incorrigible warmonger, career criminal and pathological liar. None of them wants to be associated with a criminally insane psychopath. Lastly, there are the Obamabots and Clintonistas. This particular crowd really does suffer from serious mental disease, as well as an assortment of psychological defects. Not only are they addicted to deception, many are without conscience and incapable of making rational decisions. When we say that they are sick — very sick in the mind — we mean they shouldn’t even be allowed to vote, so dangerous is their bad judgment and perverted view of government. Hence, these mentally incapacitated voters will vote Hillary no matter how many or how serious her crimes are against the American people or the world community of nations. There is only one way to prevent the Clinton Crime Machine and Democratic Party from stealing this election. Because the party machinery effectively controls virtually all the urban voting precincts, it’s very easy for them to fix the election in the major cities of each state. This is what the Democrats have always done, modeling the election thefts on the notorious city of Chicago’s Democratic vote-rigging MO. They have so many loyal co-conspirators in the metropolitan areas (most of the mayors are Democrats) that it is probably too late to prevent the massive voting fraud that is about to take place, particularly given the extremely vulnerable vote-by-mail ballot process. Hence, the only way for Trump & Company to prove an outright theft is to contract for high integrity polls to be conducted by a truly independent and highly respected pollster. The pollster MUST conduct numerous polls immediately before the election, and especially exit polls immediately following the election. This voluminous amount of “good data” ought to serve as a basis to demand recounts in the most highly contested swing states. The swings states where these polls should be conducted with great intensity are at the very minimum: Ohio, Colorado, Iowa, Nevada, New Hampshire, Virginia, and Florida. These are the states where the Clinton election crime wave will wash over like a tsunami on November 8, 2016 to steal this election. Republican lawyers and attorney poll monitors, as well as myriad citizen poll watchers, ought to be swarming around the most vulnerable polling places on that Tuesday. It ought to be understood from this 2016 presidential voting analysis and demographic breakdown that it is statistically impossible for Clinton to win. The numbers are simply not there; neither the popular nor the electoral vote will support her victory. Therefore, let this notice be put in the Internet record that if Hillary Clinton does mange to pull off a victory in November, it is only through her trademark cheating and stealing, fraud and fabrication, bribing and blackmailing, coercion and extortion. This is what the Clintons do, and do very well indeed. And the criminal Democratic Party will conspire and collaborate with them every step of the bloody way.